6 Bright and Vibrant Colors : Green, Pink, Yellow, Blue, Purple, Red. Use one or several, use them individually or mix and blend colors. Easy to Dye & Wash: The hair chalk applicators make it much simple to apply colors into your hair, the ergonomic handle ensures comfortable grip. Easy to wash out with shampoo and water. Safe to Use: Non-toxic and water-soluble, non-allergenic and environmentally friendly. Comb hair through directly on the dry hair without harm to human body and hair. 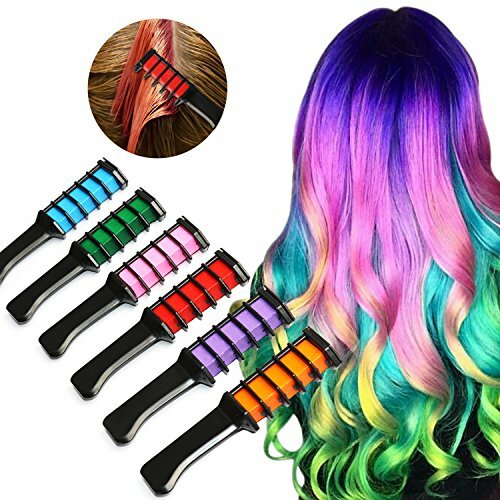 Multiple Usages: Suitable for parties, clubbing, festivals, cosplay or other occasions, creating you a beautiful and unique look for yourself. BIG BONUS: Package includes 6 hair chalk combs, a pair of disposable gloves and shawls, which will keep your hand and clothes clean when you use. Colors hair easily and with defined colors. Great colors but makes hair kinda sticky.